India’s largest bank State Bank Of India gives you facility of Internet Banking. You do not have to pay any fee for this facility, it is completely free. Including SBI all banks gives its customers free Net banking facility so that you can access your account online and many of the bank related work, especially Money Transfer, can be done online at your home. Through Net Banking, you can transfer money from your bank account to any bank account, you can send money to anyone’s account. If you wish to send money from your SBI account to your sibling or friend’s SBI account, then this work is very easy for you. Just read this article. You will understand how easy it will be to get this job done. The first thing to do is to turn on SBI Net Banking facility, if you do not have the facility of Net banking, then you can activate this facility online with your registered mobile number and Debit Card. If you having trouble with online activation, then you can apply for net banking by visiting your branch. So now I assume that you have a user ID and password of SBI Net Banking and you are ready. So let’s send Rs.30,000 from your SBI account to your friend’s SBI account. For this, we have to follow just 2 steps. First of all, we will have to register the person’s bank account, which means we have to add bank account as a beneficiary and we can send money to him when his account is activated. 1 First of all, visit https://www.onlinesbi.com, you have to login to Net Banking with your user ID and password. 2 After logging in, you have to click on Profile tab. In profile click on Manage Beneficiary. 3 Next screen you have to enter profile password for validation, enter profile password and proceed. 4 Now we are at manage beneficiary section. 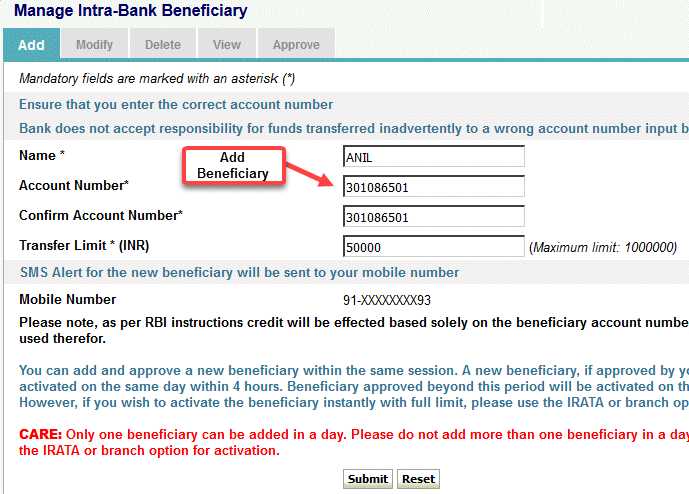 5 Next screen you need to enter beneficiary’s account details like Name, Account number, transfer limit amount. 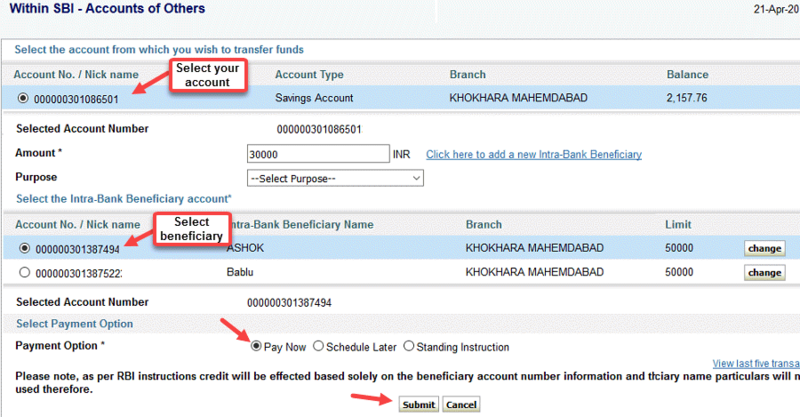 In transfer limit you can set maximum transfer limit for beneficiary. 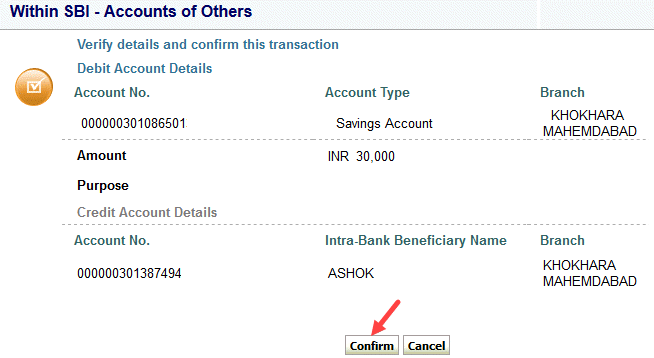 After adding beneficiary account details click on Submit. 6 Next screen you have to approve this beneficiary account so click on Approve Now. 7 Now select Approve beneficiary option. 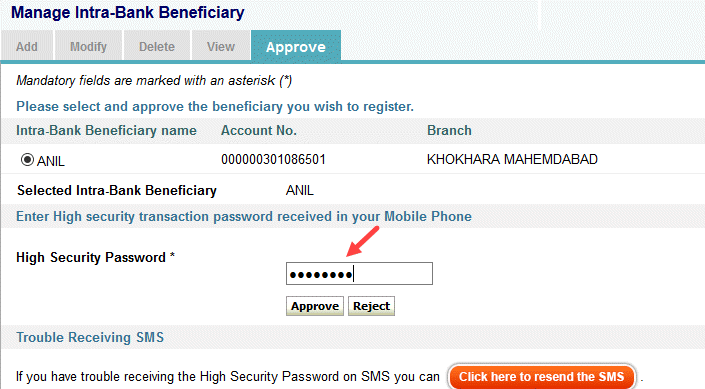 Now you will receive High security password on your registered mobile number. 9 Enter high security password in next screen and click on Approve button. Done! you have successfully added beneficiary account. It will take 4 hours to activate beneficiary. After 4 hours beneficiary account will be activated and then you can send him money. After 4 hours our beneficiary account now activated and we are ready to send money to him/her. In payments/Transfer, at within SBI click on Account of Others. 2: In next screen just select your account, enter amount, select your beneficiary (you added recently), select pay Now and click submit. 3: Next confirm your transfer, click on confirm. 4: Next you will receive OTP password on your registered mobile number, enter OTP and submit. Done! you have successfully sent money to your friend’s SBI account. You can see successful screen below. We sent this money through NEFT (national electronic fund transfer) so it will be credited beneficiary’s account within 4 hours. If you want to send money through IMPS then you need to add IMPS beneficiary which require MMID and mobile number of beneficiary. So this is how you can transfer money SBI to SBI account through Net banking. But hey if you want to send small amount below 10,000 to any account, you don’t need to add beneficiary, you just need person’s account details that’s all.